Our Nephew recently had his first Communion. As we came to celebrate his walk with God, so I couldn't resist creating a beautiful card for this big step in his life. Please, leave me a comment and let me know what you think! 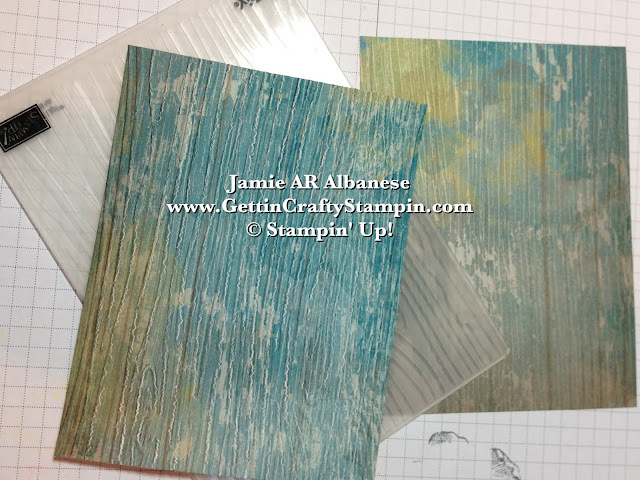 This Crumb Cake card stock (#120953) base is soft but firm for this card. Soho Subway (#130140) Designer Series Paper has a wonderful collection of eclectic patterns. 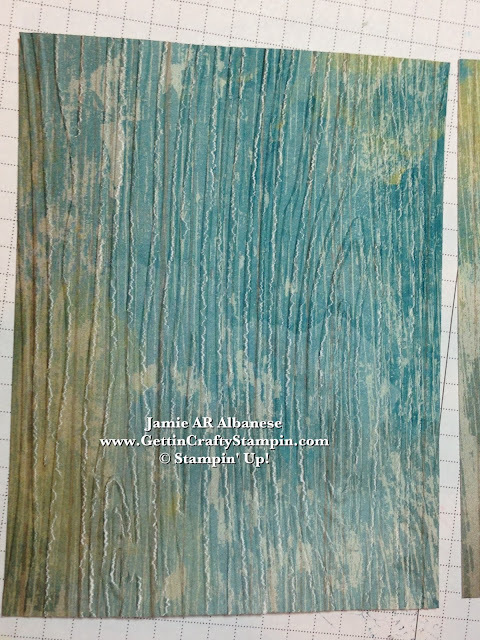 Here this blue stained wood has a distinct Indy feel to it - running it through my Big Shot (#113439) and the Woodgrain embossing folder (#127821) take this wood grain patterned paper to the next level. Take it up a notch with our embossing folders! I love texture - don't you? 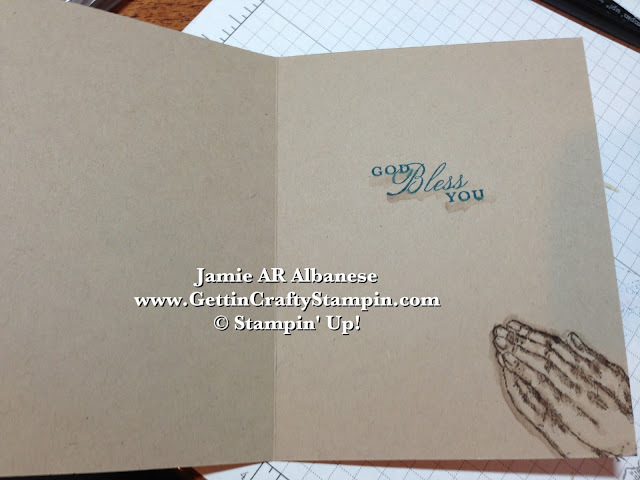 There is something about it against my fingers that makes a card (or outfit) that more appealing! 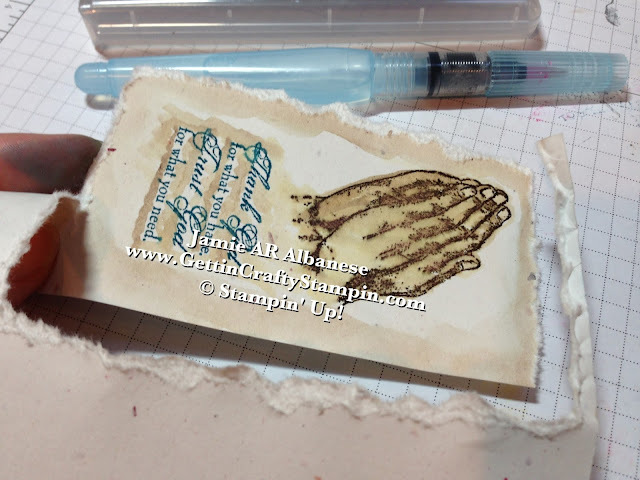 Praying Hands is a stamp set we offered last year - it retired and now lives on in my personal stash. 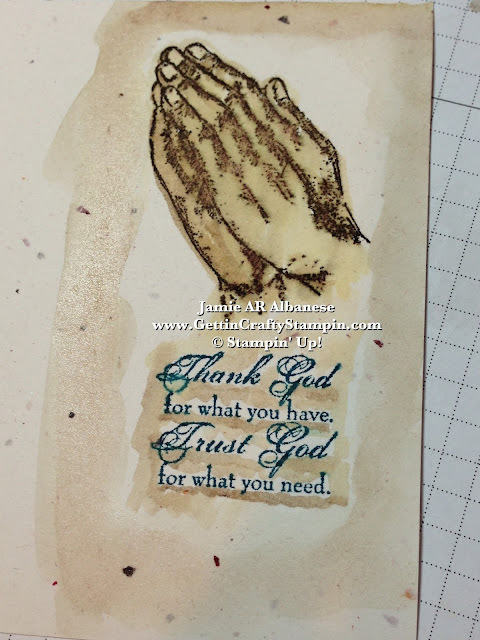 Here I stamped the hands in Early Espresso ink on our Naturals Ivory card stock (#101849). 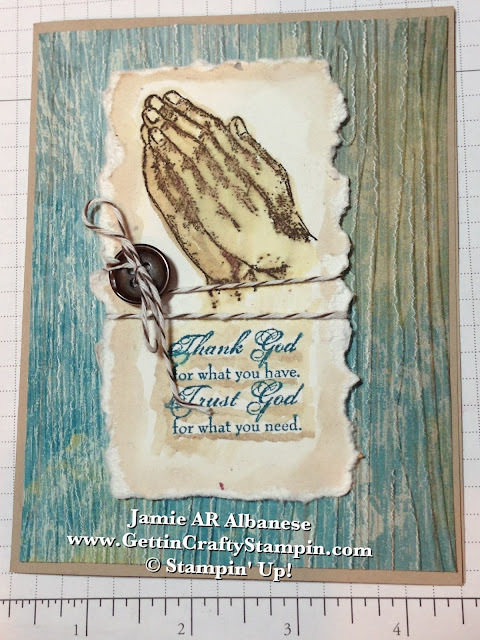 The Trust God stamp set (#132094) stamped in Island Indigo ink (#126986) to tie in the patterned paper. Here Crumb Cake ink (#126975) coordinates with the Soho Subway paper and lends to a vintage but close-to-skin look. A SECRET (shhhhhh....) did you know a fun and easy way to tear paper?? Paint it wet! 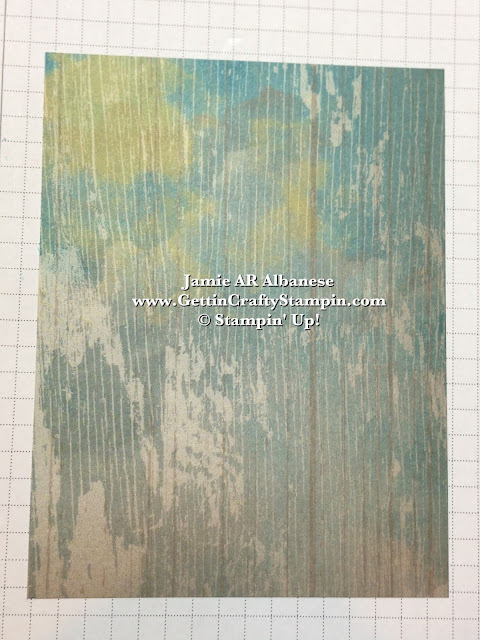 Paint the edges with water (here is used the Crumb Cake ink and Aqua Painter for a vintage colored look) and then while slightly damp, tear it... here it looks multi-tonal and distressed. Tie it up with our Early Espresso Baker's Twine (#123124) and Natural Designer Buttons (#127554) to continue that natural wood feel and look. These wood-like adornments are subtle but warm! DON'T FORGET!! Stamping the Inside of cards, the backs, the envelopes... it's all a great way to add something special and tie it all together. 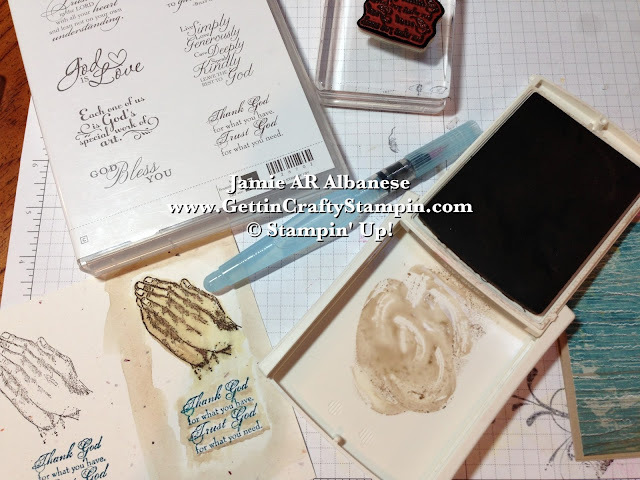 Here the stamp and supplies are already out - so stamping the inside and adding a touch of water color is easy peasy, lemon squeezy (lol). Add a dash of shadow under the words continues the feel of this card for such a subtle touch. So HERE is the Result - all pulled together. I know that my in-laws are not very verbose on their compliments... my husband married a woman who is all about words - awww, bless his heart - what a great way to grow - lol. My Sister-In-Law said this was one of my best cards, ever! WOW - for a family that rarely compliments... that's HUGE! HERE is our nephew Evan... the party to celebrate his Communion and his sister's Confirmation was a blast - we celebrated his dad's battle with cancer, too! 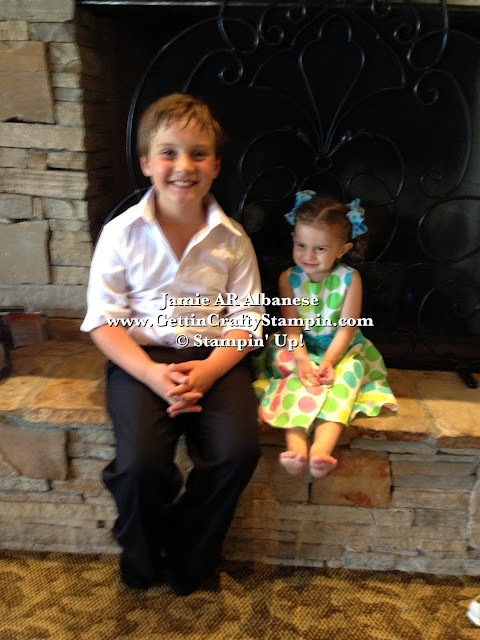 My baby girl, Arabella, took a moment to hang out with her 'big cousin' after their session of freeze dance - lol. Finding moments to celebrate and christening those moments with beautiful cards makes me feel like I'm really contributing to the celebration! 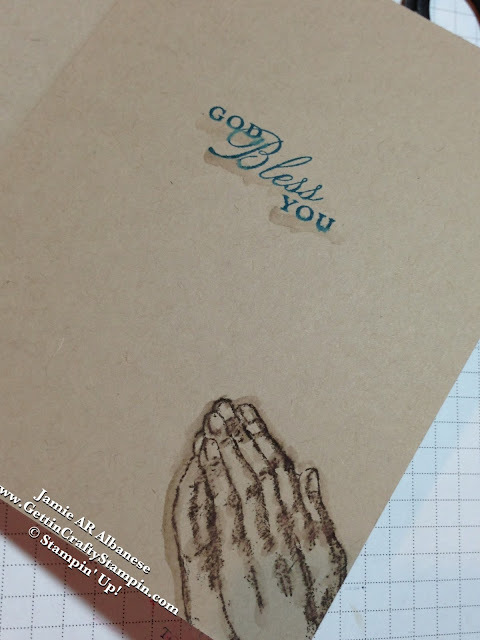 Do YOU want to make cards that are cherished? Learn FUN techniques that are sure to WOW when you take my MANY Classes!! CLICK HERE to See a Full Line-Up of my classes and RSVP YOUR Spot! Click HERE to see my Many Video's with lessons on techniques and more!